Carsten Niebuhr (March 17, 1733 – April 26, 1815) was a German traveler, explorer, and surveyor. He achieved fame as the only survivor of the Danish expedition to the Middle East and India. His fame is deserved not just for survival, however, but due to the excellence of his observations which resulted maps that were used for more than a hundred years. He also copied inscriptions of cuneiform script that proved of great assistance to Georg Friedrich Grotefend and others in their work in deciphering ancient texts from the Persian Empire. Neibuhr's explorations of what were, at the time, distant and difficult places for Europeans to travel laid the foundation for numerous later scholars to visit and uncover the secrets of past civilizations, bringing all humankind into a closer relationship as one human family. Carsten Niebuhr was born on March 17, 1733 in Lüdingworth, Lower Saxony (today’s Germany). His family had a small farm. He had little education, and for several years during his youth, had to do the work of a farmer. However, he had a talent towards mathematics, and managed to obtain some lessons in surveying. It was while he was working on this subject that one of his teachers suggested he join the expedition being sent out by Frederick V of Denmark for the scientific exploration of Egypt, Arabia, and Syria. To qualify himself for the work of surveyor and geographer, he studied mathematics at the University of Goettingen for a year and a half before the expedition set out, and also managed to acquire some knowledge of Arabic. They sailed in January 1761, landing at Alexandria, Egypt, after which they ascended up the Nile. Proceeding to Suez, Niebuhr made a visit to Mount Sinai, and in October 1762 the expedition sailed from Suez to Jeddah, journeying thence overland to Mocha, in Yemen. 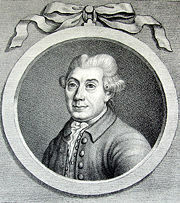 It was there, in May 1763, that the philologist of the expedition, von Haven, died, followed shortly after by the naturalist Forsskål. Sana, the capital of Yemen, was visited, but the remaining members of the expedition suffered so much from the climate and from the mode of life that they returned to Mocha. Niebuhr seems to have learned to protect his health by adopting native habits as to dress and food. From Mocha the ship sailed to Bombay. The artist of the expedition, Baurenfeind, dying on the passage, and the physician, Kramer, soon after landing, left Niebuhr as the only surviving member of the expedition. Niebuhr stayed 14 months in Bombay, and then returned home by Muscat in Oman, Bushire, Shiraz in Iran, and Persepolis, visited the ruins of Babylon, and thence went to Baghdad, Mosul, and Aleppo. He seems to have visited the Behistun Inscription around 1764. After a visit to Cyprus, he made a tour through Palestine, crossing the Taurus Mountains to Brussa, reaching Constantinople in February 1767. Niebuhr returned to Copenhagen in November, 1767. Niebuhr married in 1773, and for some years held a post in the Danish military service which enabled him to reside at Copenhagen. In 1778, however, he accepted a position in the civil service of Holstein. He went to reside at Meldorf, where he died in 1815. Carsten Niebuhr was an accurate and careful observer, with the instincts of a scholar, animated by a high moral purpose, and rigorously conscientious and anxiously truthful in recording the results of his observations. His works have long been classics on the geography, the people, the antiquities, and the archaeology of much of Arabia, which he traversed. He made the first map of the Red Sea, which allowed the British to plan their routes to India over Suez, instead of as before, around Africa. The first volume of his published works, Beschreibung von Arabien, was published in Copenhagen in 1772, the Danish government defraying the expenses of the abundant illustrations. This was followed in 1774-1778 by two other volumes, Reisebeschreibung von Arabien und anderen umliegenden Ländern. The fourth volume was not published till 1837, long after his death, under the editorship of Niebuhr's daughter. Niebuhr also undertook the task of bringing out the work of his friend Forsskål, the naturalist of the expedition, under the titles of Descriptiones animalium, Flora Aegyptiaco-Arabica, and Icones rerum naturalium (Copenhagen, 1775-1776). To a German periodical, the Deutsches Museum, Niebuhr contributed papers on the interior of Africa, the political and military condition of the Ottoman Empire, and other subjects. French and Dutch translations of his narratives were published during his lifetime, and a condensed English translation, by Robert Heron, of the first three volumes in Edinburgh (1792). In one part of his work, Niebuhr published a copy of the Behistun inscription, which he visited on his journey. His transcriptions were used by Georg Friedrich Grotefend and others in their efforts to decipher the Old Persian cuneiform script. After he returned to Denmark, Niebuhr made an official report on the expedition, published in 1772. The maps he drew proved particularly useful, and remained in use for over a hundred years. Based on them, the new trading routes were opened over Suez and across the Middle East to India. His careful copies of cuneiform inscriptions assisted Georg Friedrich Grotefend and others in their efforts to decipher ancient texts from the Persian Empire. The University of Copenhagen dedicated it's Institute for Oriental Studies to Niebuhr, naming it after him the Carsten Niebuhr Institute. Niebuhr’s son, Barthold Georg Niebuhr, became a famous German historian and philologist. Forsskål, Peter. 1775. Descriptiones animalium, avium, amphibiorum, piscium, insectorum, vermium quæ in itinere orientali. Hauniæ [Copenhagen]: Ex Officina Moelleri, Aulæ Typographi. Forsskål, Peter. 1775. Flora Ægyptiaco-Arabia, sive, Descriptiones plantarum, quas per Ægyptum inferiorem et Arabiam felicem detexit. Hauniæ [Copenhagen]: Ex Officina Moelleri, Aulæ Typographi. Niebuhr, Carsten. 1774. Description de l'Arabie. Amsterdam: S.J. Baalde. Hansen, Thorkild. 1964. Arabia Felix: The Danish expedition of 1761-1767 . New York: Harper & Row. Niebuhr, Barthold G., Johann D. Michaelis, and Robinson. 1836. "The life of Carsten Niebuhr, the oriental traveler" Edinburgh: T. Clark. The Students' cabinet library of useful tracts, 3(1): 13. Wiesehöfer, Josef, and Stepahn Conermann. 2002. Carsten Niebuhr, 1733-1815, und seine Zeit: Beiträge eines interdisziplinären Symposiums vom 7.-10. Oktober 1999 in Eutin. Oriens et occidens, Bd. 5. Stuttgart: F. Steiner. This page was last modified on 16 January 2017, at 17:21.